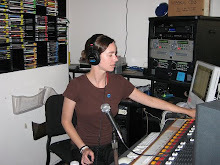 The fine folks at dublab are trying to raise funds for continued awesomeness. Go to www.dublab.com to find out how you can donate and check out their many tantalizing incentives. This week I played the new Themselves and a different cousin's boyfriend (Dnae Beats)'s band, Gift of Gab along with other fine things newish to the station. This week's highlights included a metal set of Nuclear Blast releases and my cousin's boyfriend's band Fused from Seattle. I talked up the My Hollow Drum takeover of Low End Theory this Wednesday along with the usual playing of new stuff at the station. Via Tania plays Wednesday night at The Bootleg Theater. Final Fantasy play Sunday at the Henry Fonda with the Mountain Goats, thus my mountain themed song choices below. Me'Shell Ndegeocello - Hair of the Dog - Devil's Halo - Mercer St. Here's some shows this week related to music I played on Tuesday's show. I need to add links and such. Hopefully I'll get time later today. Devendra Banhart - First Song For B - What Will We Be - Warner Bros.
A Place to Bury Strangers - Smile When You Smile - Exploding Head - Mute U.S.